Mexico, Dec. 16 (Notimex) .- The Communications and Transportation Ministry (SCT, for its acronym in Spanish) declared the Palenque Airport in Chiapas international civil airfield for the entry and departure from the country of Mexican and foreign aircrafts. Trinitaria, Chis. Mexico, Jun. 24 (Notimex) .- The Tourism Parador “Lago internacional”, located at the National Park “Lagunas de Montebello” in the Ejido Tziscao, has been rehabilitated in more than 70%. Chiapa de Corzo, Mexico, Jun. 6 (Notimex) .- More than 80 students from the Faculty of Architecture under the Autonomous University of Chiapas (UNACH, for its acronym in Spanish) built the first stage of la Casa del Abuelo "Luz y Esperanza" (care center) with reusable materials from brickyards. San Cristobal de Las Casas, Chis, Mexico, Jun. 1 (Notimex).- The Chiapas high school of Bachelors (Cobach, for its acronym in Spanish) signed the renewal of the agreement with the Agricultural School of the Humid Tropical Region (Earth University) of Costa Rica. Tuxtla Gutiérrez, Chis, Mexico, Jun. 1 (Notimex).- Students from the College of Science and Technology under the State of Chiapas of Villa Comaltitlán (CECyTE Chiapas 03, for its acronym in Spanish) obtained the second and fourth national place in the business simulator Young Business Talents Mexico. Mezcalpa, Chis., Mexico, May 16 (Notimex).- In order to boost the economy on the aquatic and fishing sector by the improvement of procreation, the dam of Mezcalpa was repopulated with more than two thousand fry, informed Manuel Narcía Coutiño. Tuxtla Gutiérrez, Mexico, May 13 (Notimex).- The State Civil Protection System informed that at least 32 tons of waste are removed from the National Park Sumidero Canyon every day, which cleaning tasks are carried out 365 days a year. 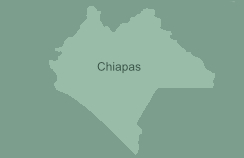 Now is active our photo gallery of Chiapas, there you can find amazing Chiapas pictures and even you can send your own pictures of your travel to Chiapas. Check the "Photo Gallery" section or just click Here.